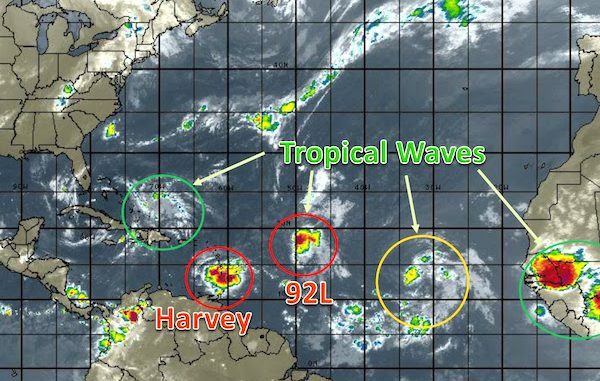 SEBASTIAN – The 2017 Atlantic Hurricane Season is busy, and right now there is one Tropical Storm Harvey and about five Tropical Waves. Tropical Storm Harvey is approaching the Leeward Islands with maximum sustained winds of 40 mph. Additional strength is expected with Harvey during the next five days. According to the National Hurricane Center, this tropical storm does not pose a threat to the east coast of Florida. Models suggest that Tropical Storm Harvey will make landfall and dissipate over Central America. A Tropical Wave known as Invest 92L is in the central Atlantic about 750 miles NE of the Leeward Islands and the system could turn into a tropical depression today or Saturday. However, environmental conditions are becoming less favorable for development. Models are in good agreement bringing 92L just north of Puerto Rico/Hispaniola by Sunday and towards the Bahamas/South Florida in 4-5 days. Even so, 92L is expected to continue as a Tropical Wave or a very weak Tropical Storm as it gets closer to Florida. The eastern Atlantic tropical wave does not pose a threat to Florida. Two other tropical waves over Africa are being monitored. At this time, there is nothing to worry about in Sebastian or Vero Beach.